On November 12, 1963, President John Kennedy issued two Presidential memoranda instructing NASA and the CIA to begin cooperating with the USSR on joint space missions including a lunar landing. On the same day, a conversation occurred between Kennedy and Soviet Premier Nikita Khrushchev on the importance of sharing information concerning UFOs as they moved forward with joint space missions. 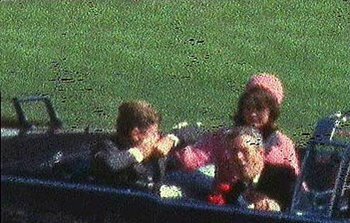 Leaked documents concerning the alleged conversation and the role of the CIA in controlling UFO information directly implicate the CIA in Kennedy’s assassination ten days later. Dean said that it was feared that mistaken UFO sightings could start an accidental nuclear war. Dean’s statement validates the content of the alleged Hotline transcript and gives support to its authenticity. ← Enceladus – Liquid water evidence?